Graph mode provides a coordinate plane with a vertical y-axis and a horizontal x-axis. Gridlines are displayed for tracing points, slopes and extreme values. The default keys in Graph mode are the same keys found in Calc mode. Type in a function into the input field. 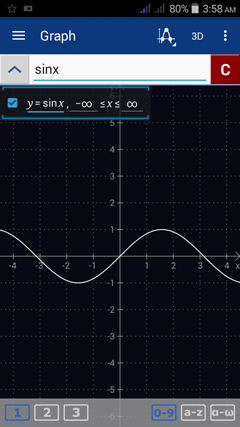 Tap the enter button to start a new function (Graph mode will display all equations and graphs simultaneously). Check the empty box to the left of the equation to see the domain of the function.